The laundry list of problems affecting the Pentagon’s F-35 fighter jet reportedly includes a high rate of false alarms from its large array of sensors. The expensive defense project is being criticized for producing an unreliable and unaffordable weapon. The F-35 Joint Strike Fighter has a number of sensitive sensors, and engineers have a hard time teaching its software to interpret the data they provide. The information must be checked against so-called threat libraries, and files of signatures of known threats. At the moment the fusion between the two is far from being complete, reports Breaking Defense, and the system currently produces many false alarms. 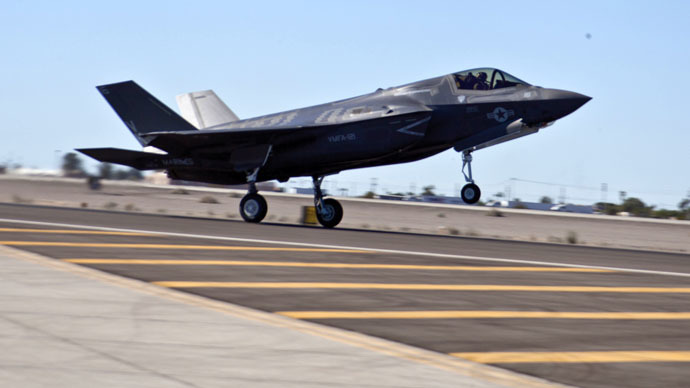 The military online magazine cites an Air Force officer familiar with the integration effort for the service’s version of the jet, the F-35-A, who said that the problem would not be fixed by the initial operating capability (IOC) deadline of mid-2016. The work on integrating the sensor data would not be complete until close to full operating capability, the report added. The Marines are to be the first to push their F-35B to IOC this summer. The Joint Strike Fighter project is meant to produce three versions of a fifth-generation combat plane for USAF, the Marines and the Navy. Plagued with deadline pushbacks and over budget, its total cost from design to retirement is expected to surpass unprecedented $1 trillion. The aircraft is suffering from numerous problems, including engines being prone to fire, software being unable to deploy the F-35’s weapons, potential vulnerability of its stealth technology to Russian and Chinese radar and the fact that terabytes of the projects technical documentation had been stolen by hackers. “So far they are spending as much effort on public relations to try to smooth the overall problems they’ve been having in actually engineering and designing the airplane,” aircraft designer Pierre Sprey told RT. According to the Straus Military Reform Project, a nonpartisan organization that calls for Pentagon reform to improve accountability and decrease defense spending waste, the plane’s testers are now “cooking the numbers” to make it appear more reliable than it actually is. It includes reclassifying failures that were previously considered inherent as induced, omitting failures of the parts that are expected to be replaced with new designs in the future, re-scoring series of unsuccessful repairs into just one repair and so on, its latest report said.